mathilda's market is in a week and a half - i can't believe it. above is a little apron i made myself to wear on the day, to hold money and the like. at pretty much every market i've done, i get people saying "are you the one girl?" and chuckling at their own mirth (it's like on the simpsons when they're at the car show - "do you come with the car?") so i'm hoping this apron will put a stop to that : ) i'm pretty much prepared, just have to put hang tags on heaps of things and make my signage (i have a crazy idea about an inkjet printed, patchwork onegirl banner...). i'm looking forward to getting the market over with, popping the rest of my stock into my shop for the holiday rush and having the freedom to work on some personal projects, like more attempts at clothes sewing and a vintage floral picnic quilt that i have floating around in my brain. 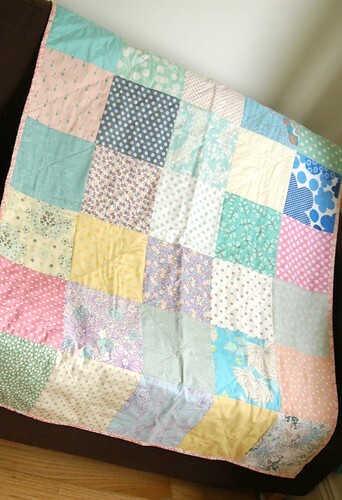 here's the second cot quilt i finished to take to the market. it was fun working in reds and blues, away from my normal, muted colour scheme, and use some new fabrics. i'm really, really happy with the way this one came out. if you want a closer look at either quilt, to see more detail of the fabrics used, click the image to go to the flickr page and then click "all sizes" above the photo. A week and a half to go! I have been feeling pretty comfortable until I saw it in black and white! I would love to love it but I can't see any pictures! Love your apron. 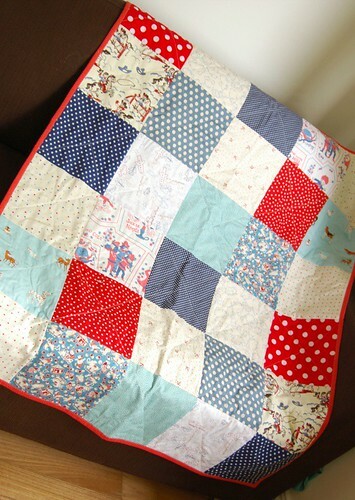 Love love love your quilts - so beautiful. Wish I was there to snaffle one up. 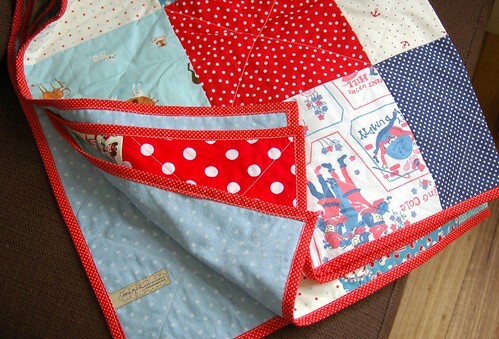 I recognise that blue and white fabric in the pink quilt from some sheets we had when we were small! 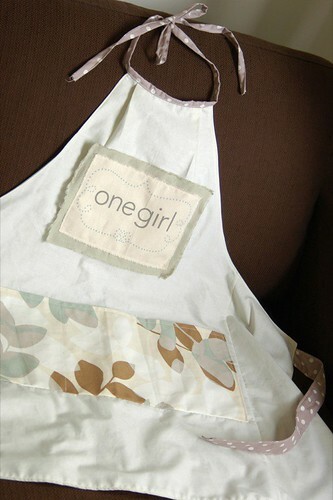 Your apron should say "That One" bahbahahaa! I just love the apron you made for yourself! It's just darling. I received a beautiful birthday card with a stitched on bumble bee, made by yourself. So thank you to you for making such a lovely card to receive in the post and I'll be having a word with my sister for being a week late!